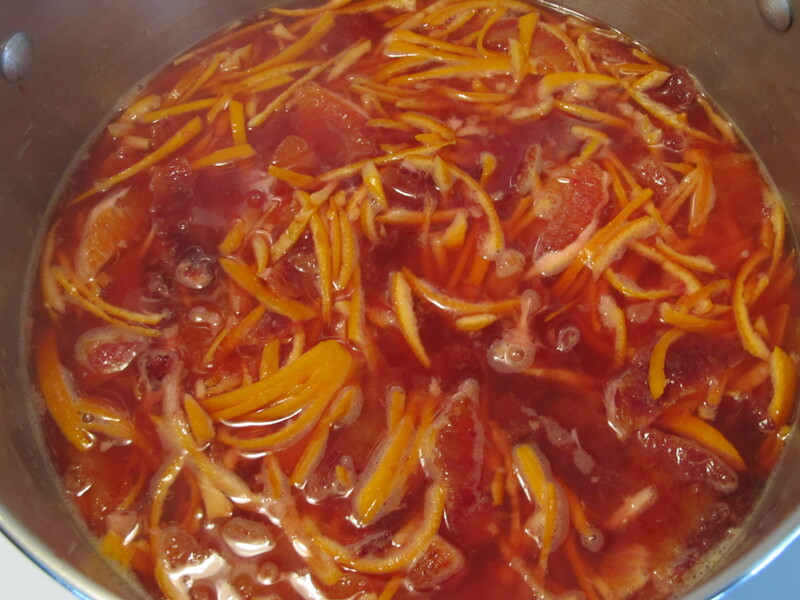 I’ve always had it in my head that making marmalade was hard. I mean…growing up, I would always look at all the little wee bits of orange and citrus peel so delicately suspended in all that tasty goodness. Visions of someone slaving away at the kitchen tediously removing pith and cutting perfect slivers of citrus peel just kept me away from ever attempting to make some. It wasn’t until today when I was reading about Cara Cara Marmalade that I was inspired to make my own adaptation. Special thanks to Isabelle from foodbuzz.com for reassuring me that it is super easy to make. First of all, I didn’t have any Cara Cara Oranges. No matter – I wanted something bold, with a nice pop of colour to get me through these last few weeks of winter. Since Moro oranges are in season (and there were a couple of pounds of them sitting in my fruit bowl), I decided to use these tasty little morsels in my version. The striking rich red colour is just utterly amazing….like viewing a sunset in a jar. I also loved the lovely red hue that was left on my hands. It’s a small price to pay for our craft. Enjoy all! 1. Using a sharp knife, trim the top and bottoms from the oranges. Remove the peel and place in a large stainless steel saucepan with a generous amount of water (to cover). Bring to a boil over medium-low heat and let boil for about 10 minutes. Drain. Cover with fresh water and return to a boil. Boil for another 10 minutes until the peel starts to become soft. Drain. 2. Scrape the white pith from the peel with a spoon and discard. Cut the peel into strips and place in saucepan. Segment the oranges over the saucepan to catch any juices. Squeeze the membrane to remove as much juice as possible. Discard seeds and membrane. 3. Bring to a boil over medium-high heat, making sure to stir occasionally. 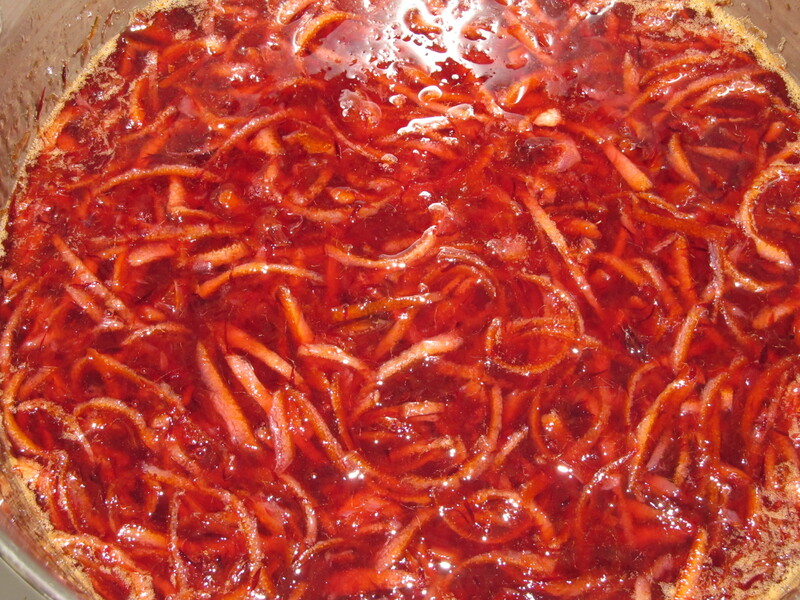 Reduce heat and gently boil, stirring occasionally until the peel becomes soft – about 30 minutes. 4. Meanwhile, prepare the canner, jars and lids. 5. 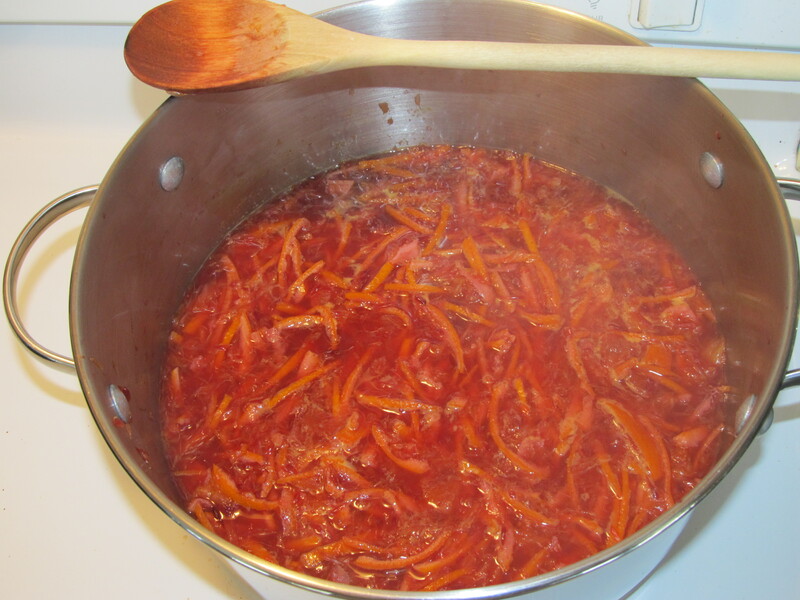 Increase the heat on the marmalade back to medium-high. Slowly stir in the sugar while maintaining boil. Boil for 12 minutes, or until your thermometer registers approximately 220F. 7. Remove from heat and skim off foam. 8. Ladle marmalade into hot jars, leaving 1/4 inch headspace. Wipe rims, center lid and screw band down until finger-tip tight. Place jars into canner and process for 10 minutes. Let stand in canner for 5 minutes. Remove jars from canner and cool.